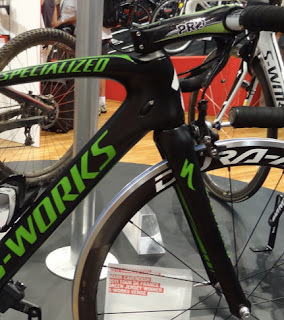 Specialized won the Worlds! The recent winners of the mens Road World Championships for Road and Time Trial both used Specialized bikes to capture their victories. 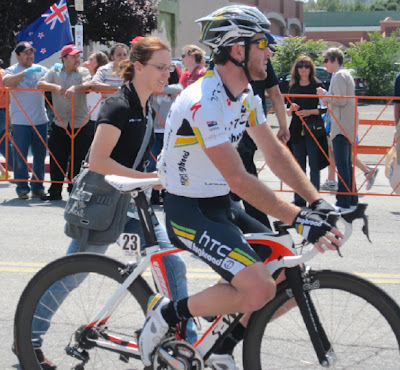 Both Mark Cavendish from Great Britain (World Champion Road) and Tony Martin from Germany (World Champion Time Trial) rode for the 2011 HTC-Highroad team whose bike sponsor happened to be Specialized, and so at Worlds, both lucky cyclists were on Specialized bikes. 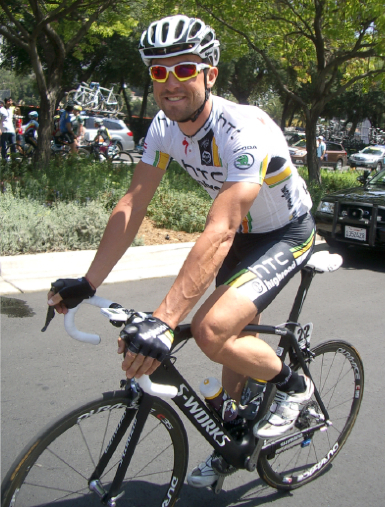 After a very successful 2011 season, HTC-Highroad has folded, which leaves the lucky teams remaining under sponsorship by Specialized to be SaxoBank-Sunguard and Astana. 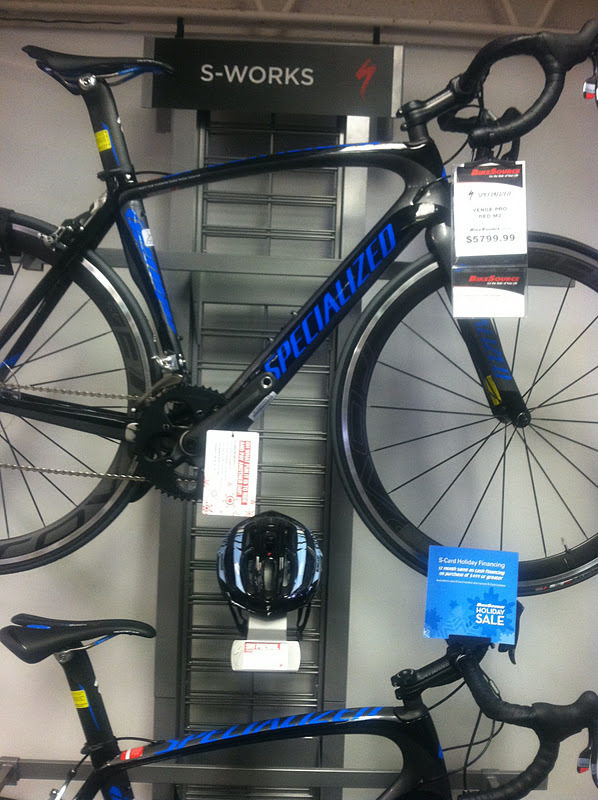 I would consider a team sponsorship by Specialized to be a fortunate one. 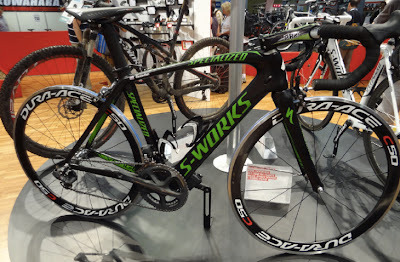 I am thinking Fabian Cancellara might be missing his Specialized bikes (he now rides Treks), and Mark Cavendish will certainly miss his Venge McLaren bike in 2012 (he will ride Pinarello). 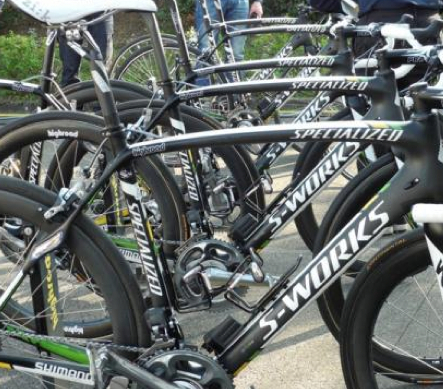 Specialized will be adding a new team sponsorship for bicycles and helmets to Omega Pharma-Quick Step team in 2012 and will remain as sponsor to the Specialized-Lululemon (former HTC-Highroad) women's team. 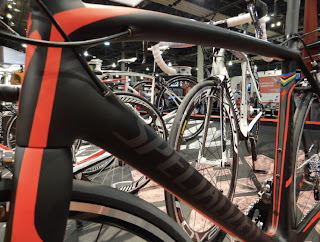 Knowing that Specialized makes very nice bikes that perform well, it was with great excitement that upon arrival at Interbike 2011, I looked directly for the Specialized booth. 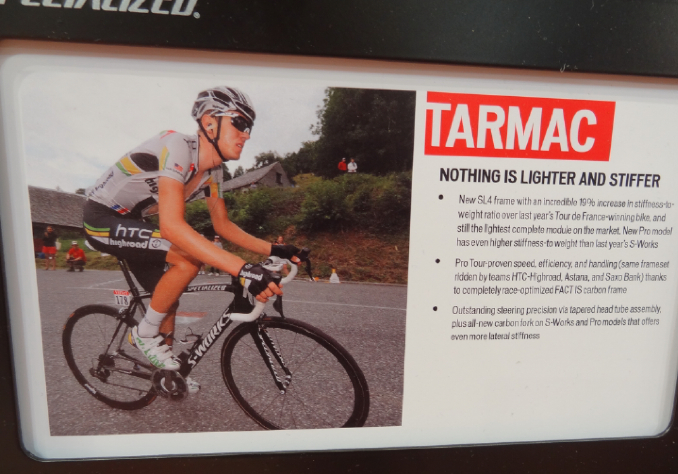 Their huge sign directed me to their location. 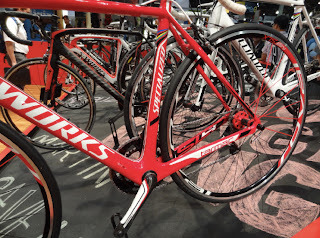 I knew I had arrived when the first person I saw was Chris Horner (Team Radioshack) drooling over the bikes (his team rides Trek!). I came to see the Tarmac SL4. 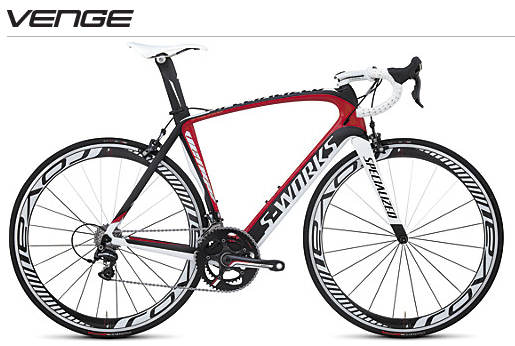 I receive a number of google searches for the SL4 so I thought I would give the reader what they wanted. 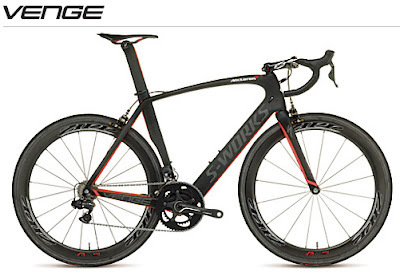 Probably because at $8000 it is a dream purchase for the amateur cyclist knowing that the Venge might be just out of their reach with a sticker price of $18,000. In 2011 Specialized bikes delivered riders to the finish line to capture these race wins: Points Classification (green jersey) at the Tour de France (Mark Cavendish), German National ITT Championships (Bert Grabsch), Irish National RR Champs (Matt Brammeier), Irish National ITT Champs (Matt Brammeier), Belarus National ITT Championships (Kanstantsin Sivtsov), Denmark National RR Champ (Nicki Sørensen), Kazakhastan National RR Champ (Andrey Mizourov), Slovenia National RR Champ (Gorazd Stangelj), Scheldeprijs 1st Place (Mark Cavendish), Ronde van Vlaanderen 1st Overall (Nick Nuyens), Milan San Remo 1st Place (Matt Goss), Paris-Nice 1st Place Overall (Tony Martin), 6 stages of the Tour de France, 5 stages of the Giro d'Italia, best overall team at the Giro d' Italia and at the Tour de France, plus many more wins. 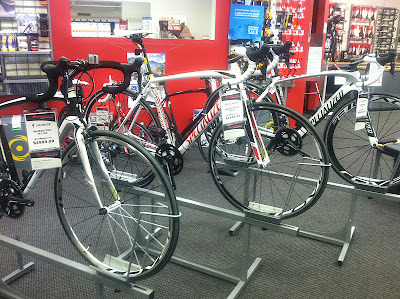 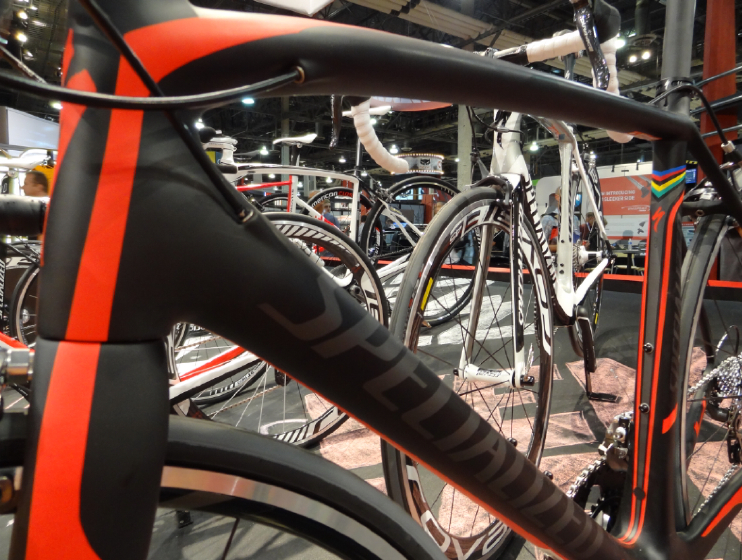 Let's take a look at the Specialized bikes available including the Venge, Tarmac SL4, Tarmac SL3, and the Roubaix. 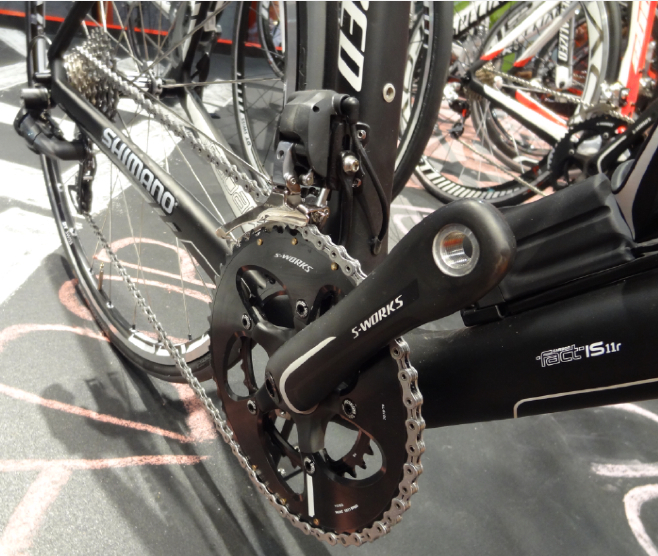 With a peak at the Amira and the Shiv TT. 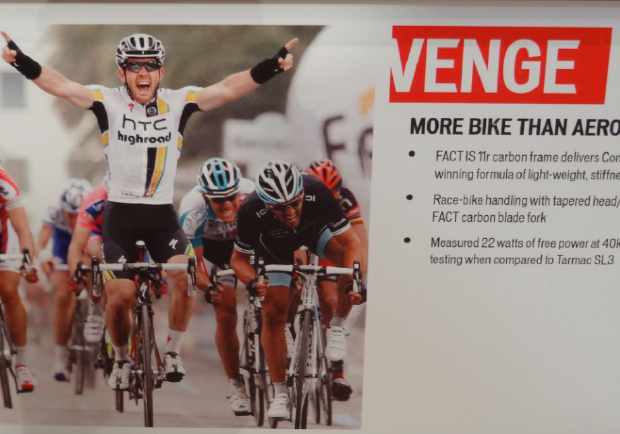 Matt Goss was the man who first tested the Venge McLaren on March 19, 2011 at the 1-day classic Milan San Remo - he won. 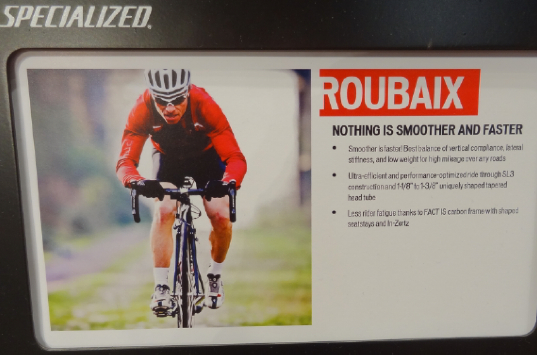 Read A fast man on a fast bike. He later handed in his Venge McLaren for a different model of the S-Works Venge (above). 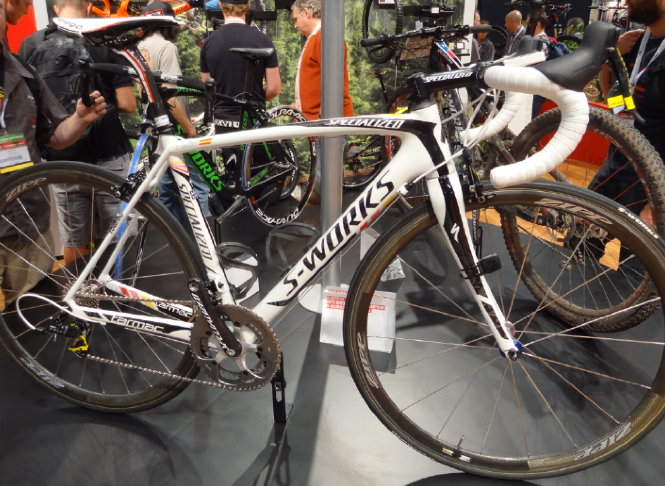 Mark Cavendish then used (and was the only rider to use) the Venge McLaren at Scheldeprijs on April 6, 2011 - he won. 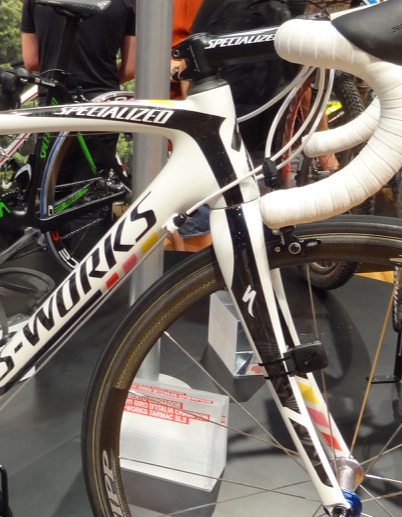 He never looked back and stuck with the McLaren or the S-Works models of the Venge for sprint stages for the remainder of his season. The marketing department at Specialized likes to refer to the bike as "more bike than aero." 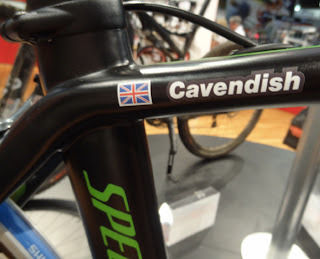 This phrase always makes me pause, what does that mean? 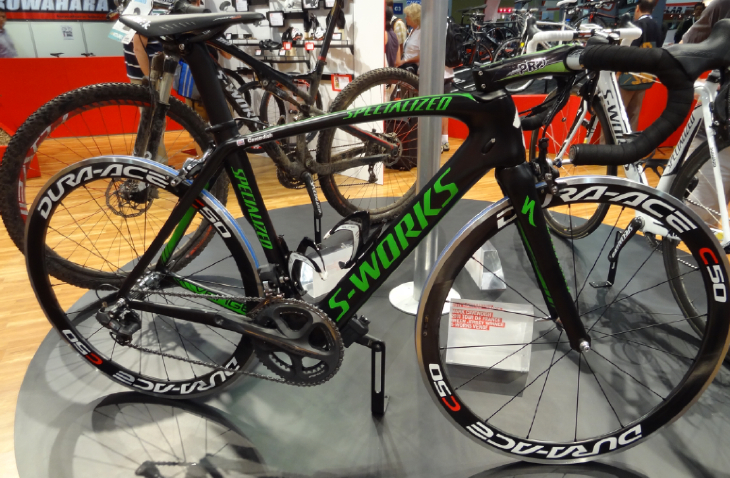 This is Mark Cavendish's points classification (green jersey) winning S-Works Venge bike recently on display at Interbike 2011. 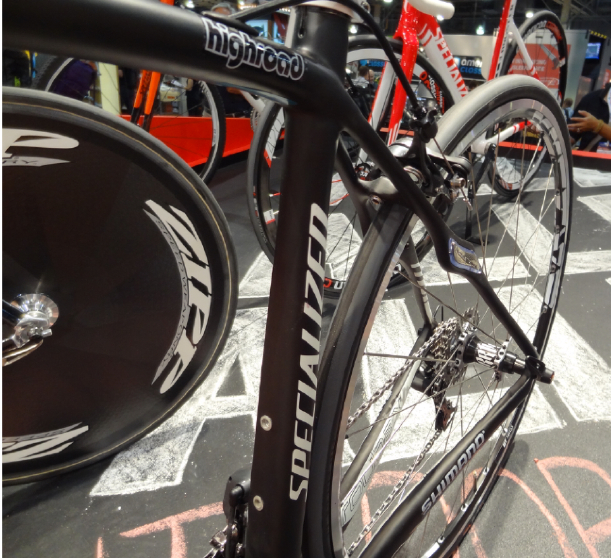 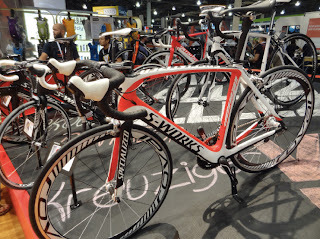 S-Works + McLaren Venge. 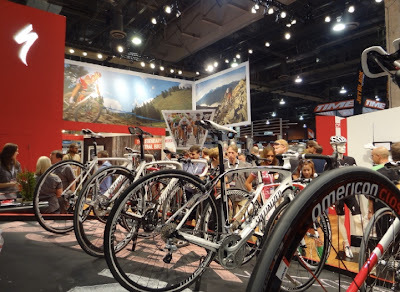 They hang $18,000 bikes from the ceiling at Interbike. 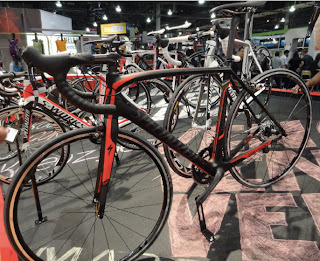 There are three types of Venge bikes: S-Works McLaren Venge ($18,000, 12R carbon), S-Works Venge ($8900-$9200, 11R carbon), and the more affordable Venge Pro ($5700-$6000, 10R carbon). 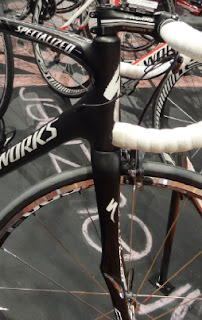 The S-Works and the Pro have the same frame design and geometry (and exterior electronic Ui2 unit), but are made of differing quality (technique) of carbon weave material. 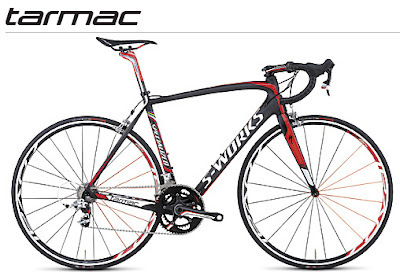 The McLaren of course is the lightest stiffest design with the Ui2 body hidden inside the frame. The more you pay the more you purchase light weight stiffness (10R, 11R, or 12R). HTC-Highroad mechanics at the 2011 Tour of California add some final touches to the bikes. 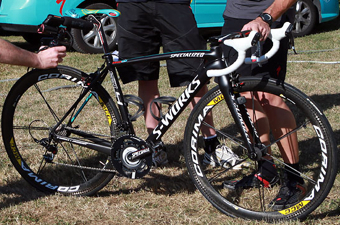 Bernie Eisel is on the left with a Tarmac, Matt Goss is center with his new Venge (not the McLaren model). 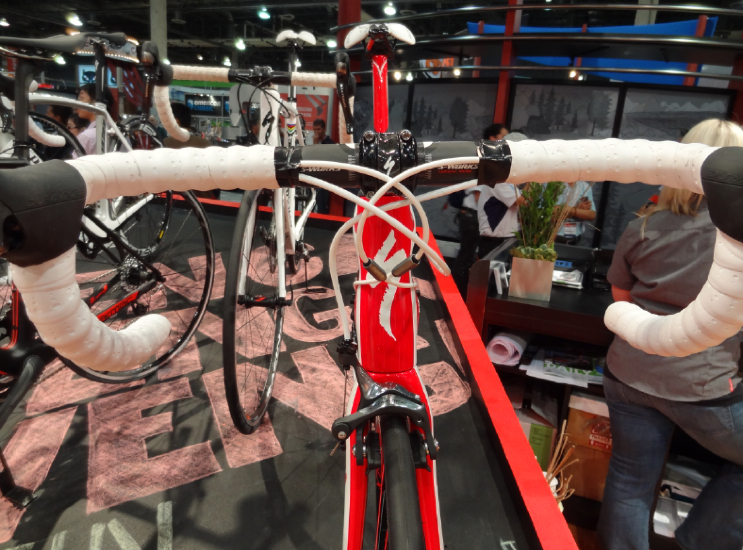 Notice the difference in the headtube angles when the bikes are side by side. 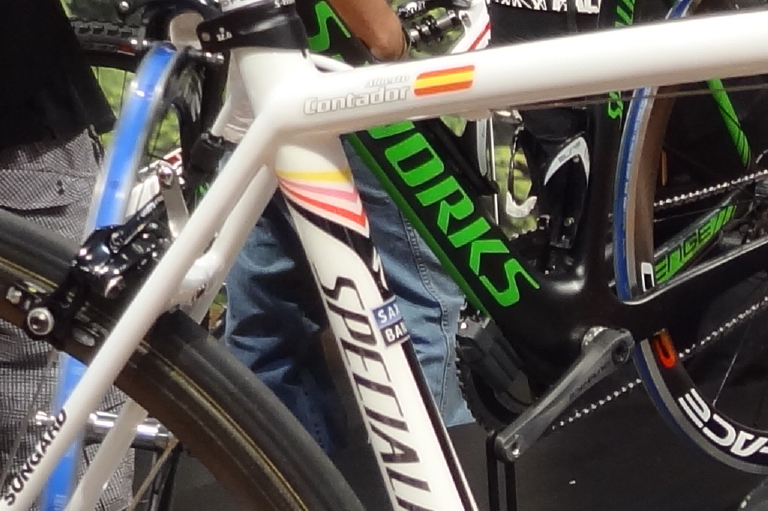 Now notice the difference in the seatstays. The Venge and the Tarmac SL4 are the frames that will now be used in the Grand Tours by the Pros. Think of the Venge as the aero sprinter, the SL4 as the climbers bike. 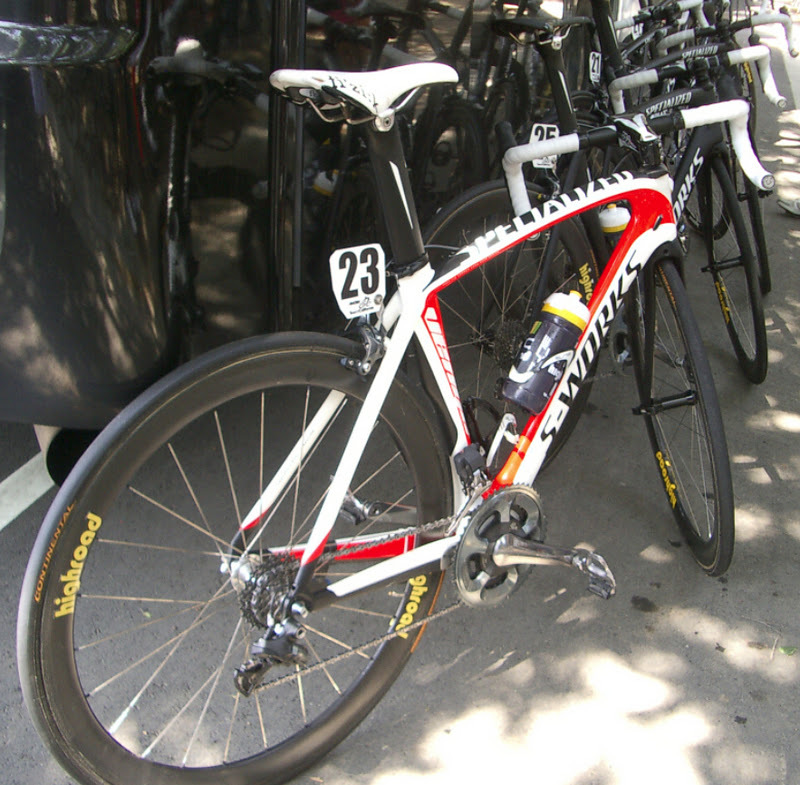 The riders can change frames and wheels according to the profile of the stage and the riders preference. 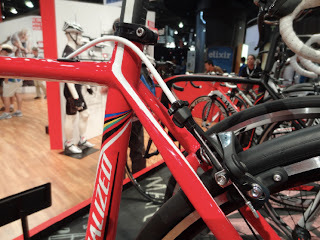 Once the rider is fit using the Specialized BG Fit system, the basic position of the rider on the bike is determined and does not change drastically. 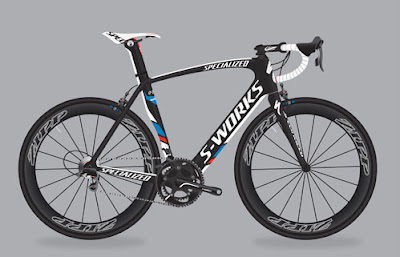 It gets confusing because there is a Tarmac SL3 and the newer Tarmac SL4. Both are still in use. 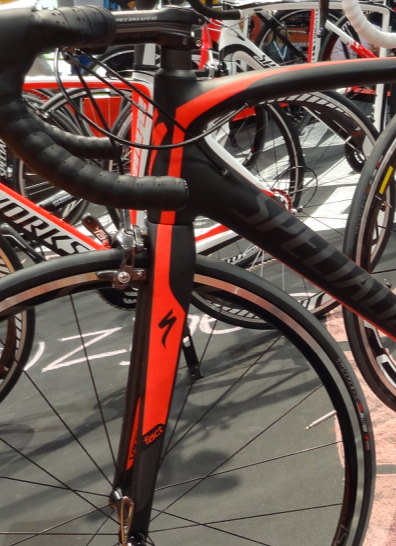 The SL4 was designed to be lighter and stiffer than the SL3. I was told the designers tapered the headtube, made the front fork and rear seatstays wider for increased lateral stiffness. 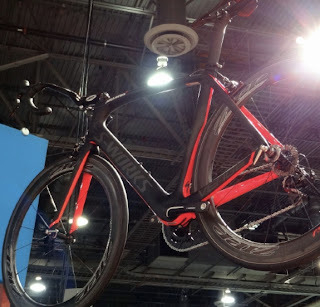 The SL4 is reported to have better breaking performance, better handling, and better durability when changing out wheels quickly. 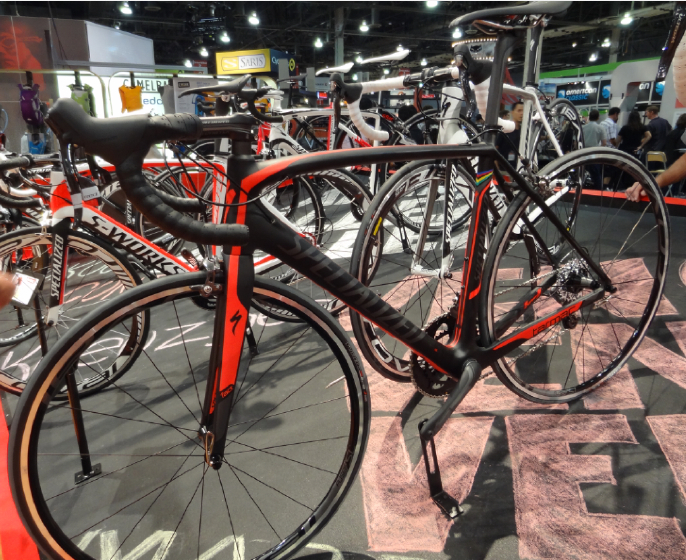 The improvements in the SL4 equate to a claimed 19% increase in stiffness to weight ratio over the SL3. 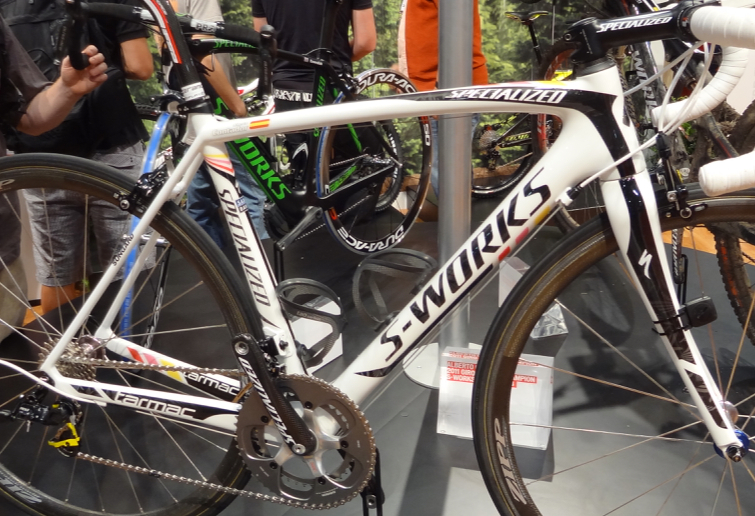 The new SL4 was tested out at the 2011 Tour de France where Roman Kreuziger and Alexandre Vinokourov each rode the SL4, both happened to crash out of the Tour so we were never able to experience their full performance. Specialized talks the talk about how the pros use the Roubaix frame for the Classics, but here Nick Nuyens is riding a Tarmac for his win at the 2011 Tour of Flanders. 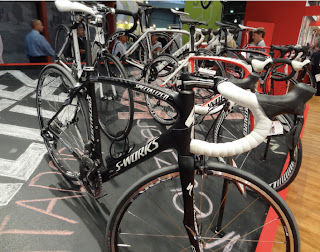 More images of the S-Works Tarmac SL4. Team HTC-Highroad rode the Roubaix frame at the 2011 Paris-Roubaix. 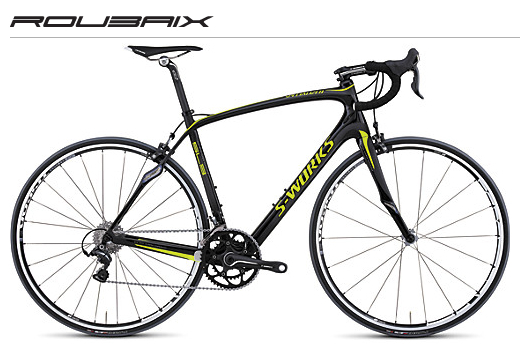 The most noticeable feature of the Roubaix are the dampening seatstays and front fork. The pros will lower the head tube as much as possible and select their wheels to fit the parcours. This frame is the comfort class, recommended for most amateur cyclists who like to ride long rides over mixed terrain, a durable, hard worker. When I asked the question "which bike would be best for a cyclist traveling to Europe to ride a cyclosportif and then spend a week climbing in the Pyrenees?" The answer was the Specialized "Roubaix with a DT Swiss or Mavic type of wheel." 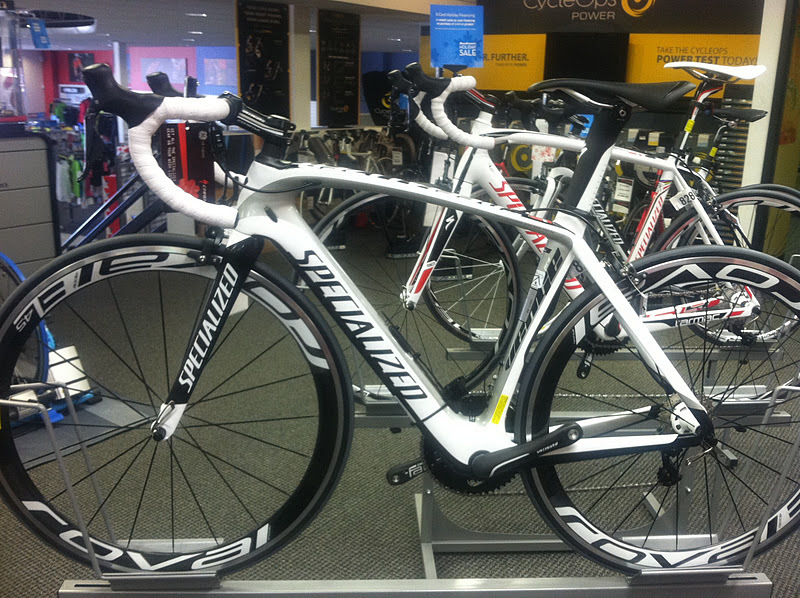 Specialized Shiv TT frame only $6100. It is so fast it doesn't need wheels. 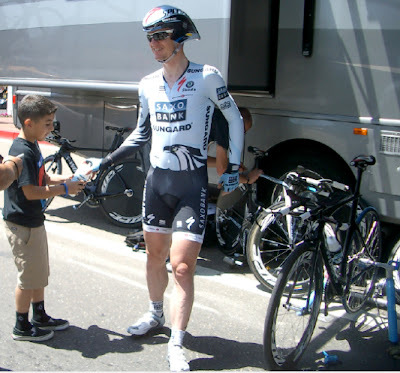 Peter Velits, Brian Vandborg, (with Ted King on the left) wait with their HTC and Saxo-Bank S-Works Shiv TT bikes at the Prologue of the 2011 USA Pro Cycling Challenge. They have a different handlebar set up. 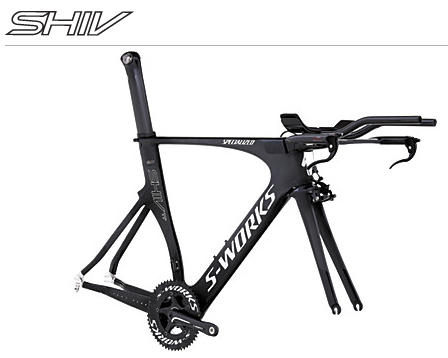 The pictures above are the 2011 Shiv Time Trial model. 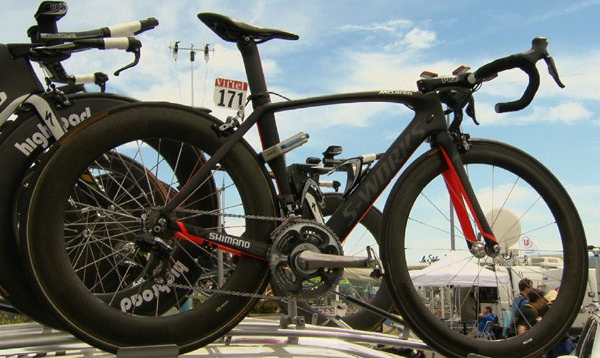 Specialized recently released the newly designed tri-specific Shiv in 2012, which will not be used at road races. 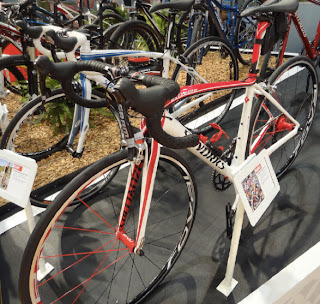 The tri bike will be used by triathletes only. 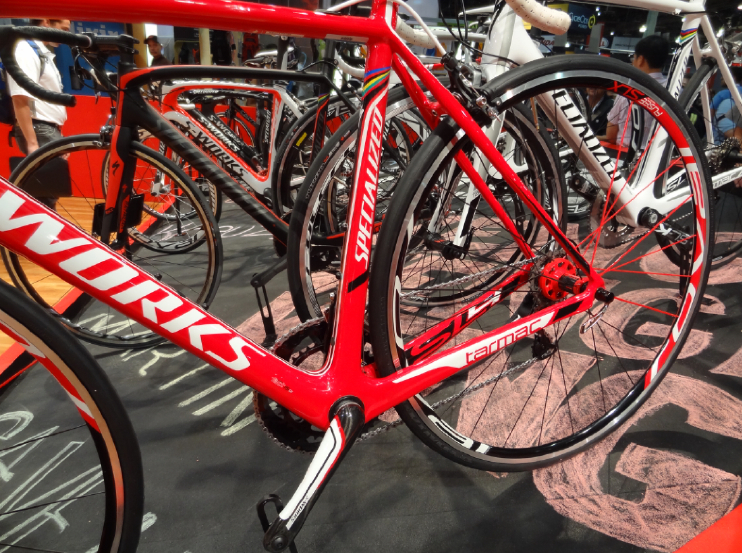 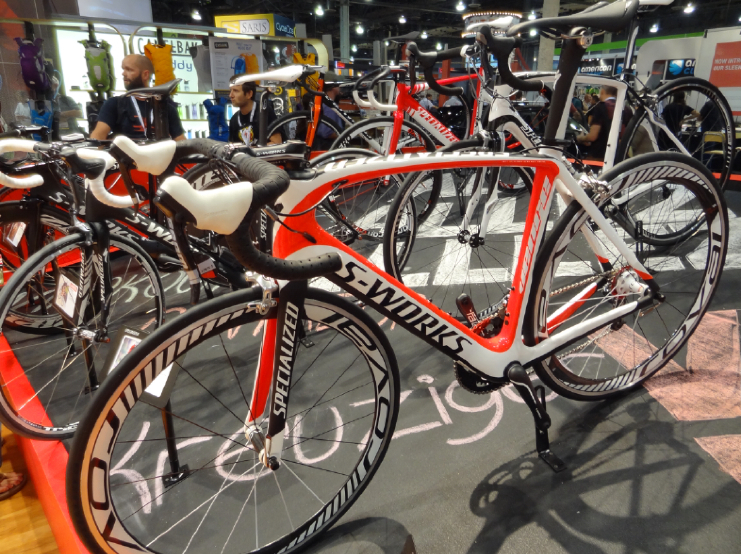 See the bike, and read the review by Nick Legan of VeloNews here: You won’t see Levi racing this: Specialized’s new Shiv. The tri-Shiv does not meet the guidelines of the UCI (the International governing body for professional road racing), read more in a previous post by PedalDancer.com: Why all the fuss over Time Trial Bikes? 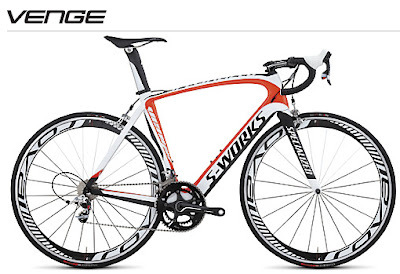 Update November 2011: This is the new 2012 Omega Pharma Quickstep Specialized S-Works Venge bike for 2012. Read and see more images of Specialized Bikes on Pedal Dancer.